Budapest Christmas would not be complete without a bit of public transport in a Xmas mood: the Christmas streetcar / tram. 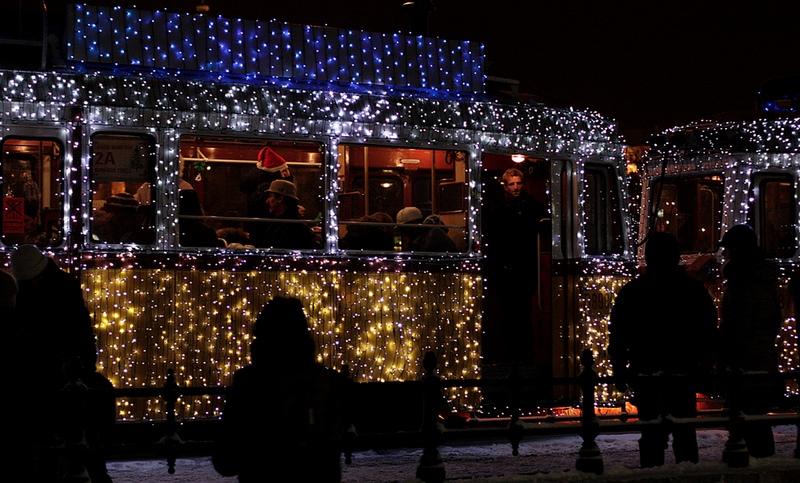 One of the loveliest Budapest Christmas sights is the Budapest Christmas Streetcar number 2, and some more Budapest trams turned into a festive sight with many thousands of lights (approx. 39,200 white and blue LED lights). There is no surcharge to travel on the Budapest Christmas Streetcar, you can use your Budapest Card or public transport travel pass, tickets as on any vehicles of the BKV company in Budapest. However, there will be special Christmas tram rides too (see details below). The trams are not well heated, so do get dressed well for the rides! The complete 2018 schedule of the Budapest Christmas trams has already been issued by the official Budapest public transportation company (BKK for short). 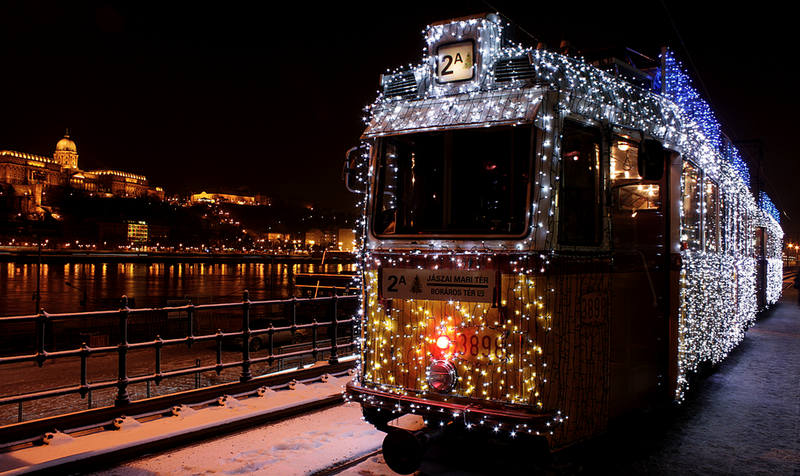 The number 2 Tram – the scenic, award winning tram along the river Danube – will run daily during the Christmas holiday, beautifully lit. Trolleys lit up for Christmas are also scheduled for 2018! Please take a look at the schedule below to get a rough idea of what to expect in 2018. There are streetcars bearing number 2 or 2A on their cars. 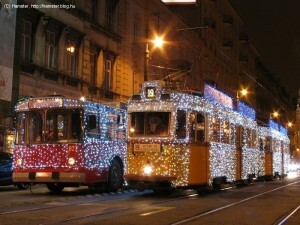 Some of the trams 2A have been dressed up for Christmas. Tram 2A is running along the river Danube as if it was a land based Budapest river cruise. Tram 2A leaves from Boraros square (Boráros tér) by Petofi Bridge (on the Pest side), which is the terminal of the 2A streetcar line. The other terminal of the 2A tram is Jaszai Mari Square (Jászai Mari tér) by the Margaret Bridge, where the Christmas streetcars await those waiting for a special journey. In addition to the Pest side ‘sightseeing streetcar’number 2A – 2A and 2 trams chosen as the most beautiful scenic streetcar routes in Europe by National Geographic magazine – you can also get a Christmassy ride on the Buda side, parallel with the river Danube promenade. The tram is number 19, whose scenic route starts from the Liberty Bridge (by Gellert Baths and Hotel Gellert), up until Batthyany Square, which is just opposite the Hungarian Parliament. Although the full route of tram 19 in Budapest is much longer, the most scenic part is between the Danube bridges. The special rides are longer and special fees are charged for them by Budapest BKV company. 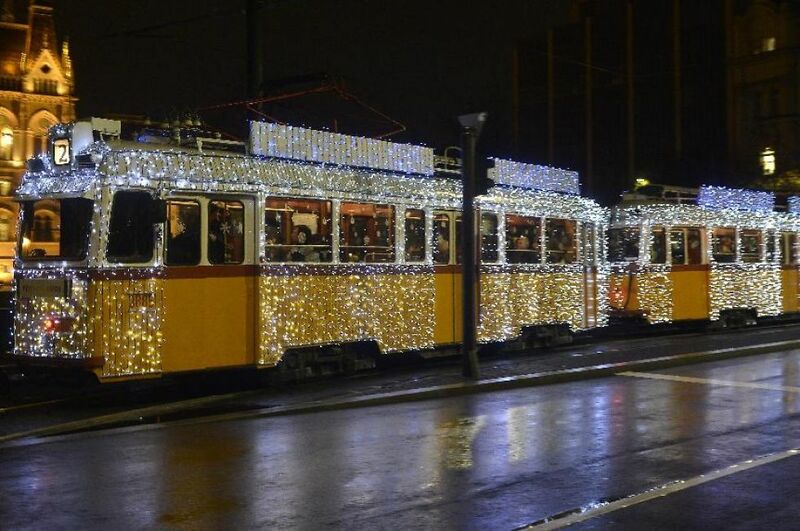 Two festive Christmas Light Trams will leave Boraros Square (Petofi Bridge) on certain days in December with a special fare. 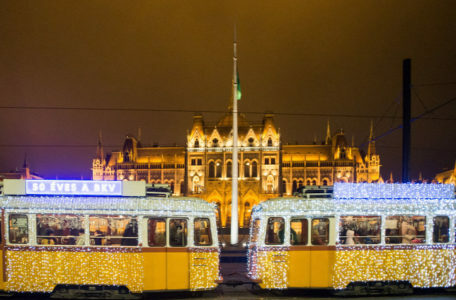 For instance, the Christmas Light Tram will take a ride to the Buda hills on a designated day (Huvosvolgy, Farkasret, Kamaraerdo), and another to the outskirts of Pest side of Budapest (Pesterzsebet, Kispest and Pestlorinc). Both night Light Trams leave at 9 pm and will wander about in the night (tram fans in Hungary love these night rides). Please note that there are no Christmas trams on Dec 24 (Szenteste / Holy Night), and on New Year’s Eve in Budapest (Dec 31). general information waited to be published by Source: BKV.hu Christmas news. BKV is the official public transport company in Budapest, Hungary.